Unfortunately possibilities to drive as fast as you want on normal roads are very limited. There are obstructions like other traffic, playing children, police cars and wild animals to take into consideration... But there is actually a solution to all of these problems: Racing. Now I'm not talking about street racing, but racing on real race circuits. Many people start measuring their (car's) strength on a straight road. Two cars next to each other trying to reach 1/4 Mile (402 m) as quick as possible. I've done that also. That can be fun, and it's a good way of measuring how quick you and your car is. But when you add the thrill of once in a while turning the steering wheel, braking at the right time and then step on the accelerator again. That's when the REAL fun begins. Welcome to the exciting world of racing! Here is a list of the race circuits that I myself have driven. Listed in order with my favourite track at the top and the least interesting one at the bottom. From Stockholm, where I live, down to Nürburg is a distance of about 1440 km. 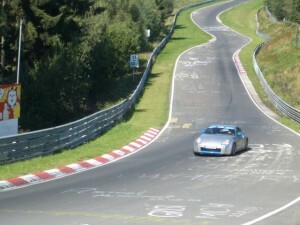 This year (2005) I drove down to "the Ring" seven (7) times. Perhaps that is enough information for you to understand how much I love that place. For me it is Heaven on earth. Or "the Green Hell" (die Grüne Hölle) as others prefer to call it. Too many people have found out why it is called the green hell. The reason may be that next to the track you have approximately two meters of green grass before the guard rail. And two meters is very seldom enough space to slow down a car or motorcycle that has misjudged the braking point. That is why you really need to have respect for the track. And unless you are the king of Master Mind, it takes many laps to learn the track. It is 21 km long and has 33 left hand corners and 40 right hand corners. What also makes the track so special is the 300 meters difference in altitude between the highest and lowest point of the track. You can very well have sunny and warm weather in one part of the track at the same time as it is raining in another part. 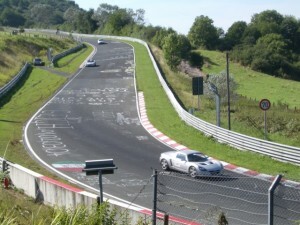 Check out the "Links" page for more information about Nürburgring! Do you think that racing can be fun? Something for you? If you live in northern Europe you can turn to Gentlemen Racing Club, to make your dreams come true! GRC organizes Track Days mostly in Sweden (Knutstorp), but also in Belgium (Spa) and Germany (Nürburgring). We haven't got the schedule ready for 2006 yet, but there will be many opportunities for racing experiences! We will most certainly have a "replay" of the very appreciated "End of Season Racing Weekend" that took place in the end of October in 2005 with one day at Spa in Belgium and one day at Nürburgring. Everyone is welcome to the GRC Track Days. We have both beginners and experienced race drivers at our meetings. There is also a very mixed lineup of different cars -you don't need to have a top-of-the-line race car in order to have fun on the track. We also have instructors that can both teach the beginners and help the more expreienced drivers with tips of improvements. You can also sign up for the GRC newsletter (also available in either Swedish or Danish) just by entering your E-Mail in one of the forms below. Then you will be updated with new racing events to come as well as reports from previous events. You can use the same form if you wish to unsubscribe from the mailing list. Your E-Mail address will not be used in any other purpose than for GRC news.